Rare earths are usually found intermixed and must be extensively processed to separate. The 17 rare earth metals, except for promethium, are not rare but are so named because they typically aren’t found in concentrations that support profitable mining operations. The elements have various technical applications, from advanced batteries to electronics. China is the leading producer of most rare earth metals, but the U.S., Canada and Brazil are among those becoming more involved in rare element mining. Few mutual funds invest in producers of these metals, which are more easily traded through exchange-traded funds, which are commonly known as ETFs. Reuters reports that China produced 97 percent of the world’s rare earth elements in 2011, when it decided to halt production at three of its eight mines. The market for these metals is expected to double in the next five years, according to Reuters, and China is positioned to control global supply and prices. 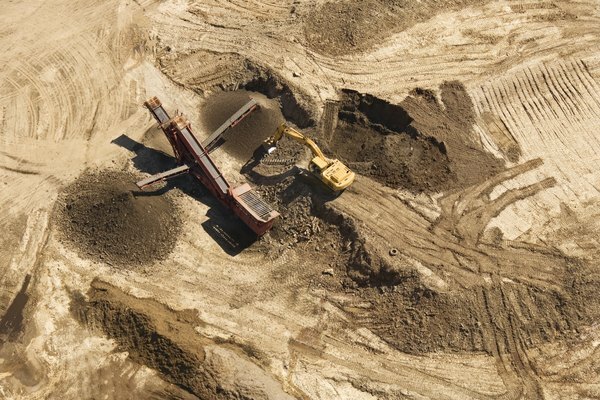 Despite rising demand, stock prices for rare earth producers have been soft for all of 2012, according to the STOXX Global Rare Earth Index, an indication that investing in rare earth companies can be risky. Rare earth indexes do not track the prices of these elements but rather the companies that mine, process and transport the metals. Several rare earth indexes in use today set benchmarks for funds investing in rare earth companies. The STOXX Global Rare Earth Index tracks companies that derive at least 30 percent of their revenues from the rare earth sector. The Bloomberg Rare Earth Mineral Resource Index is more broad based than STOXX, as it includes any company that has rare earth resources. Rare earth mutual funds are themselves very rare, having largely been replaced by exchange-traded funds, or ETFs. A rare earth mutual fund is a pool of money from investors who want exposure to companies in the rare earth sector. It is professionally managed and provides for contributions and withdrawals at the request of investors. One of the few remaining rare earth mutual funds is Swiss-based Dolefin Rare Earth Elements Fund. Its dropped 39 percent in value in 2011 and lost another 19 percent in 2012. An ETF is a basket of stocks usually tied to an index. Rare earth ETFs offer several advantages over mutual funds. They have lower expenses and can be purchased or sold any time the stock market is open, while mutual funds are only purchased or redeemed after the market closes for the day. Most rare earth ETFs are tied to an international index. For instance, the Van Eck Global Rare Earth/Strategic Metals ETF is based on the Market Vectors Rare Earth/Strategic Metals Index.